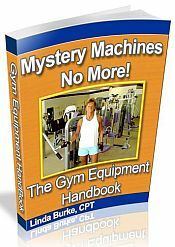 Sign up NOW for my ridiculously awesome newsletter and I'll send you a free copy of my eBook, The Gym Equipment Handbook. By learning to use the machines correctly, you'll get twice the results in half the time! Stay on top of the latest fitness tips, advice, and news from Straightforwarditness.com by signing up for the FREE monthly newsletter. On the 15th of every month you will receive the newsletter in your email, but please don't forget to whitelist me. I hate spam too, so don't worry. Your email address is safe with me. If you'd like to take the newsletters for a test-drive before submitting, please click here. JUST A FEW POSITIVE VIBES FROM MY PEEPS! Linda Burke’s guidance has been invaluable and her vast knowledge of strength training, food choice plans, and cardio tips have inspired me towards weight loss and reshaping my body. I am presently 41 pounds down and am closing in on my goal weight with each passing day. I recently graduated from her 1-on-1 training to her online program and the weight continues to come off. –Dana T.
Being new to weight training at first I was reluctant, but Linda’s motivation and encouragement has truly fueled my progress and adherence to the fitness commitment. Without her I am sure I would not have made the progress that I have or work out on a regular basis. Linda’s dedication to technique and quality workouts has helped me become more flexible, fit, and healthy. –Bonnie O. Yesterday, my chiropractor asked me about my personal trainer. I told him I really liked Linda as a personal trainer because she taught me proper technique with machines and free weights, how to slow down the exercises, how to do stretching between sets, and what moves I should avoid to prevent neck pain. My doctor thinks Linda did a good job with me, and I couldn’t agree more! –Fran L.